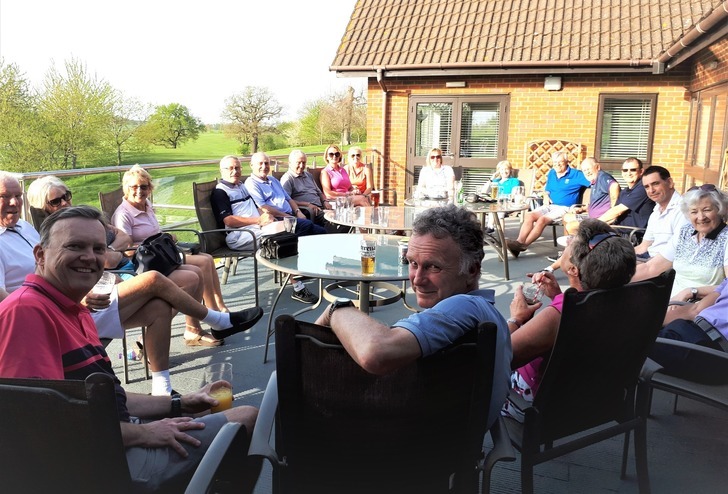 We had a great weekend of mixed golf with lots of our members joining in the Good Friday and Easter Monday competitions. The weather had clearly brought out the crowds as we hadn't seen this many for a long while. 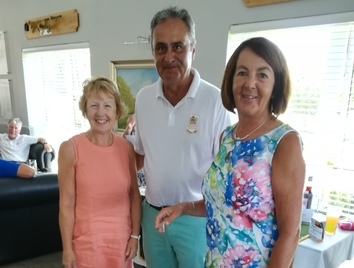 We added a few twists to make things on course even more fun, so on Friday, double scores were awarded on the par 5s and this was won by Sue Glover. On Monday we played with a Joker and a Mulligan. 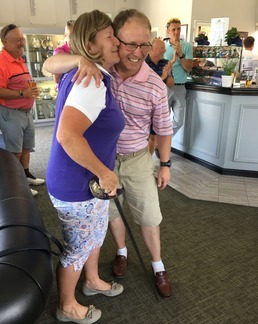 Again, great fun was had by all, and this time won by Sue Marsh & Joe Nellis (pictured below). 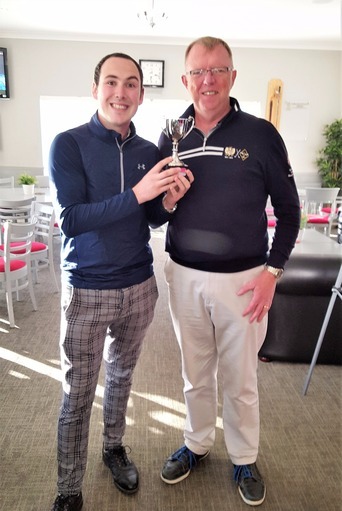 Following the Easter weekend events above, a Club Competition (The Salter Cup) takes place on Sunday 28th April, so if you enjoy mixed golf, there's plenty to look forward to. Look out for the sign up sheet with full details on the Social Noticeboard. 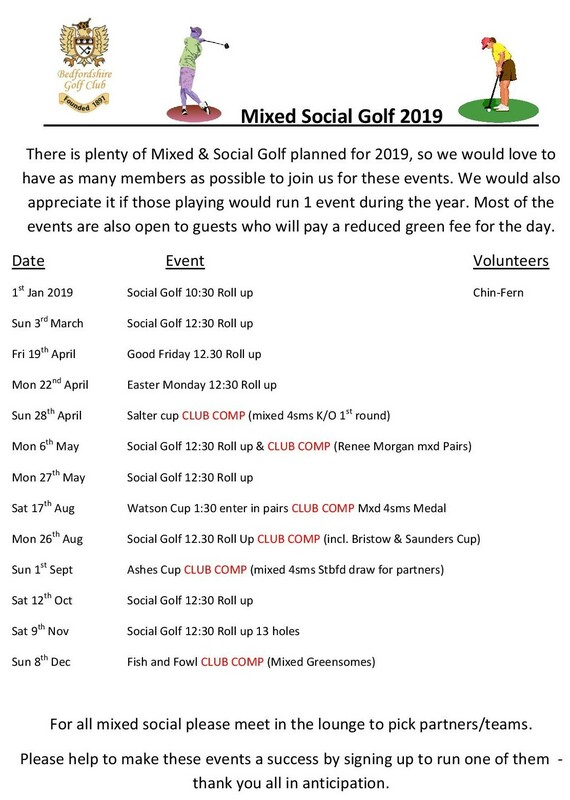 Our full calendar of Mixed Social Golf Events for 2019 is below, so do come and join in the fun and competition. New Year's Day Early Risers! 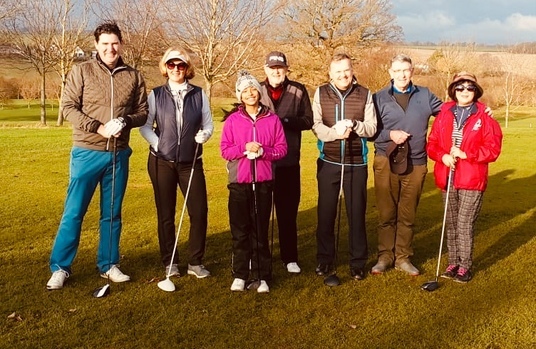 New Years Day 2019 dawned bright and sunny resulting in a turnout of 7 for the Social Golf Session. Playing in 2 groups, a shortened 13 hole game was agreed to take into account aching limbs and jaded spirits from the previous night’s festivities. 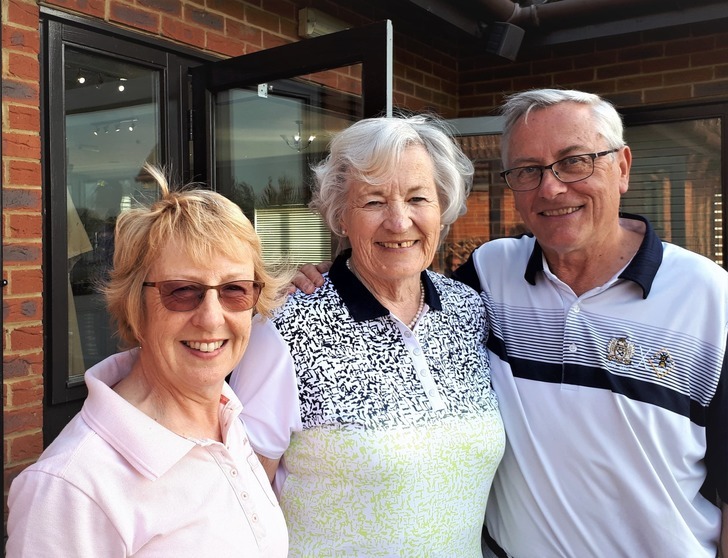 Some surprisingly good scores were helped by drier conditions, some accommodating greens and glorious sunshine throughout the morning to wake us all up. Well done to all those who made it out so early! 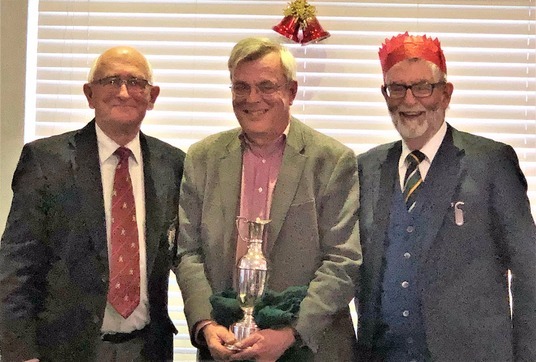 Over 100 members took part in the Stagsden Trophy, which was played over two days last weekend and celebrates the Club's opening in Stagsden in September 2000. 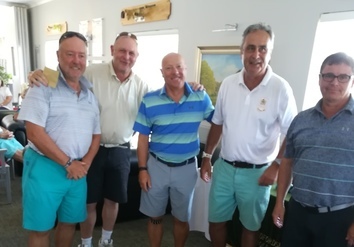 As ever, there was a really competitive feel about what is an important event in the Club's calendar and conditions over the two days varied to make things even more interesting. To show how tough things were for the field, only 4 players managed to score below their handicap and none of these were by more than a couple of points. 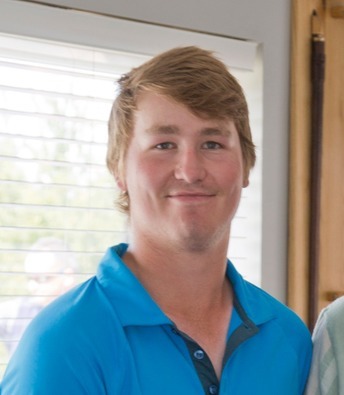 but the overall winner, also with 38 (c/b) and playing off scratch was our Club Champion, Seb Lovell. On another glorious summer morning, President's Day was attended by nearly 100 members - all there to fight for top spot, in each of the Member sections. Our grateful thanks go to President Roger for his generosity to the members and his excellent oversight of the event. Festival Weekend Competitions - who won what? In the seemingly endless sunny conditions of summer 2018, our 7th Festival Weekend was another great success. 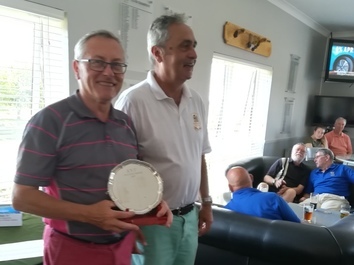 On Friday the men’s Festival Trophy was well supported and was won by Mark Lewin with 41 points. 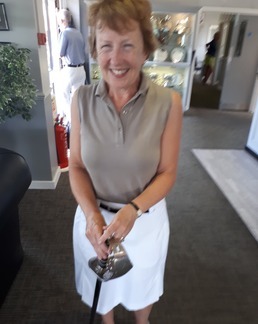 The ladies Pauline Sampson Trophy was won by Brenda Beard with 40 points. As an idyllic summer Sunday morning dawned cloud and wind free, 85 bleary eyed competitors gathered for the 7:45am shot-gun start of the annual Lord Lieutenant's Trophy. 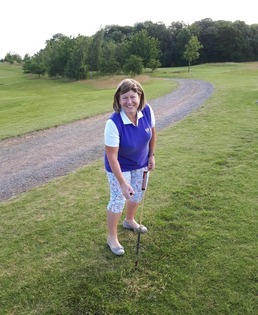 Waking everyone up with a bang however was Helen Nellis, who launched the rocket to start play. 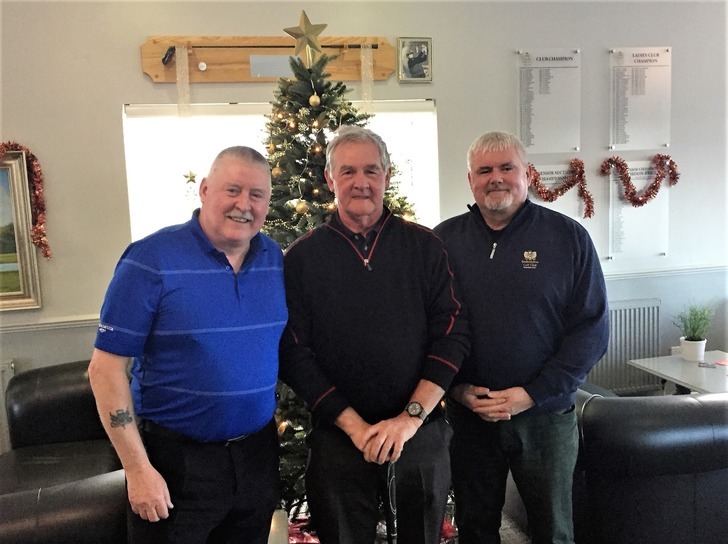 The course was in its usual excellent but challenging condition, with the greens ironed so the ball sped through as if on a glass table, whilst the deep rough was left very deep indeed! A few rather wayward individuals apparently spent longer searching for their ball than actually playing with it. Nevertheless, the time came for a new champion to be crowned and whilst a well known member of the men secured victory, a lady found herself in the top 3, missing the coveted prize by one point. 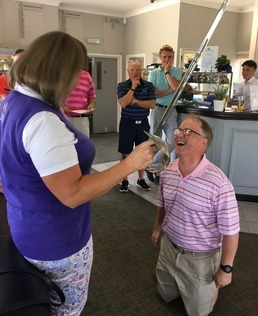 In the photos, David can be seen being 'knighted' by our very own Lord Lieutenant of Bedfordshire and Sue got the chance to hold the coveted sword. Post presentation, a World Cup lunch was served whilst watching England emerge victorious against Panama with an amazing 6-1 win. Not sure he's taking this seriously enough! Best lady - Sue Marsh. This competition which is open to full members starts on Wednesday evening the first week in July and runs for 8 weeks, with the final on the ninth week. The competition was set up by Tony Williams and Keith Burgess eleven years ago, and is open to full adult members. The idea was to play a game after work, so a 15 hole round seemed ideal teeing off between 4pm and 5.30pm, followed by social time in the bar and bit of banter! Each week the winner and runner up pocket some winnings- all the other monies in excess of weekly winnings provide the final prize money. Finalists are those who have been the eight weekly winners, and the player with the highest score who has not been a winner, making a total of nine to contest the final. The numbers have increased year on year, and on one Wednesday last year we had 43 entrants. Hope to see all our loyal supporters return again this year, and we look forward to seeing new members joining the fray. For further information see the notice board, or speak to Keith or Tony who will be happy to help you. Five teams, each comprising one Golf Professional and three Club Members, competed for the honour of becoming the 2017 BGC Pro-Am Winners. 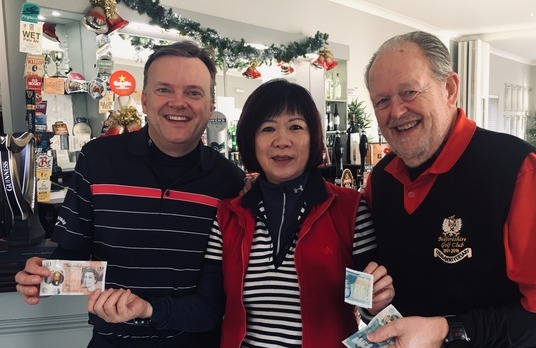 It may well have been a fun Pre-Christmas social event, but it was clearly taken very seriously by most as after 18 hard fought holes, the scores for four of the five teams had only one point separating them! 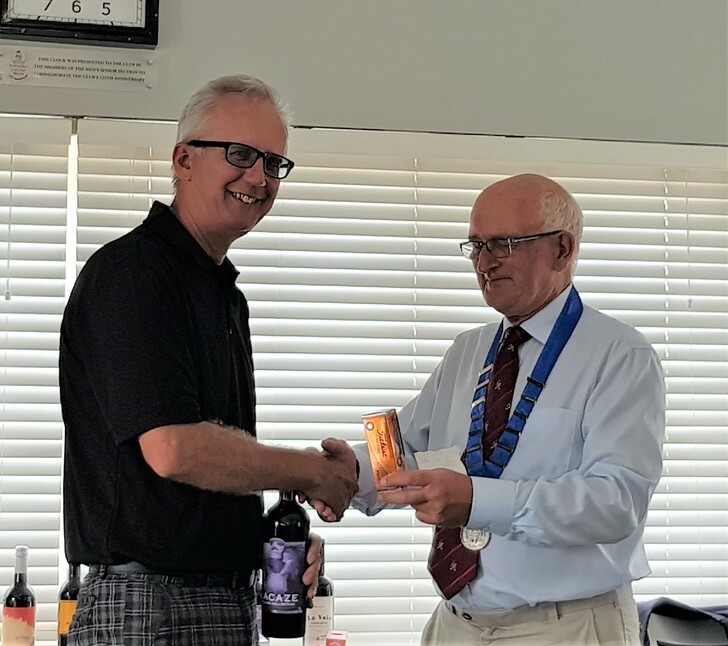 Best Gross Score was by Richard Kemp who went round in Gross 67 - very impressive indeed. The fun occasion was rounded off with a bowl of Adriana's very tasty Goulash and few glasses of festive cheer to accompany it. A fun time had by all. 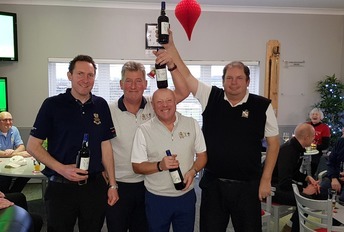 Well done to the winning team and of course Richard for his great round of golf. Individual winner Richard Kemp, counting his pile of cash! clearly had a few by this time! Around 40 BGC Members were out early on Boxing Day to burn off some of those Christmas Day calories (and dare we suggest to clear a few sore heads) by taking part in the John Jappy (Snr) Boxing Day Challenge. The competition is arranged by John and Bryan Jappy - in memory of very long standing member John Jappy Snr. It is open to all categories of membership and seen as a very inclusive Post-Christmas event at Stagsden. The conditions were unseasonaly mild and some of the better golfers made the most of this to put in good scores. Due to everyone’s generosity, the raffle on the day raised £425 for the Captain's Charity which this year is Bedford Samaritans. Well done to all who came out and took part. B.O.G.S. Christmas Competition and Lunch - 9th December. 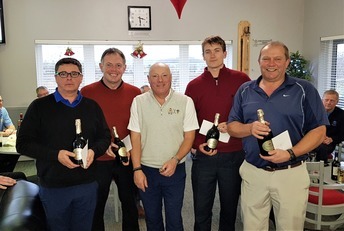 The Annual B.O.G.S Christmas competition and lunch took place on Saturday 9th December. 43 Members of the B.O.G.S. 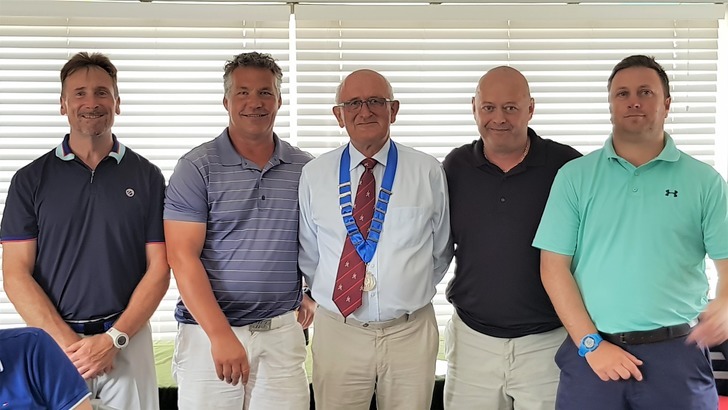 along with 7 guests, including club President Roger Willis, current club captain John Simpson and Head Professional Geraint Dixon, assembled in the clubhouse at 7.30am on what was a glorious sunny but somewhat frosty morning. Competitors were treated to a pre round warm up of coffee and whiskey shots and the usual early banter and speculation of the days potential winners. Although the course was in great condition a heavy frost overnight made approach play very interesting around and on to the greens. 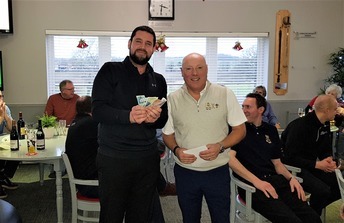 However, the early morning sun, thoughts of a full roast dinner and a number of potential chances to win one of the various competitions kept the spirits up and a great mornings golf was had by all. Also up for grabs was the coveted overall B.O.G.S champion for 2017 which is based on the combined individual score from the summer and winter competitions. Several B.O.G.S were in the running for this title but after much anticipation it was Tony Marsh, pictured with the B.O.G.S champion jug, who was crowned with the 2017 title. 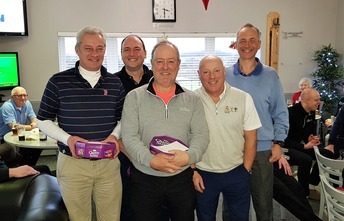 The final trophy of the day was a new annual award introduced to reflect everything that is great about the spirit and camaraderie that exists in the B.O.G.S and was presented for great company, good humour and progress towards faster play around the course. There was no doubt that the first winner of this trophy, Peter Gill, was a worthy winner. All agreed that the day’s event had been a very enjoyable end to the B.O.G.S season. 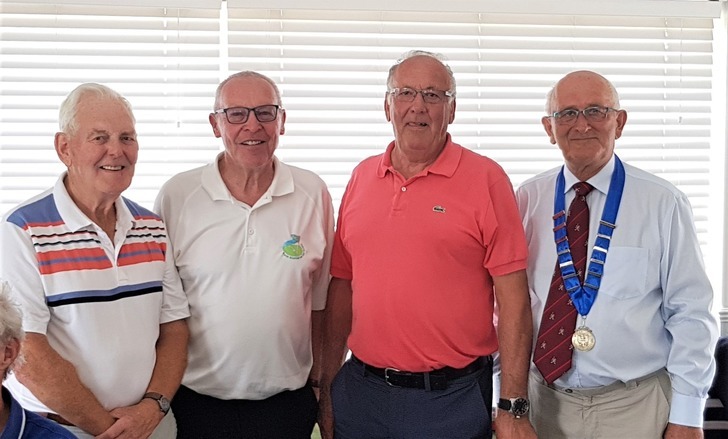 On Saturday, 40 members gathered in the bar at 11.00am and watched the end of the morning monsoon blow through before setting out in teams of 4 to contest the End Of Season “best two of four” team Stableford competition. 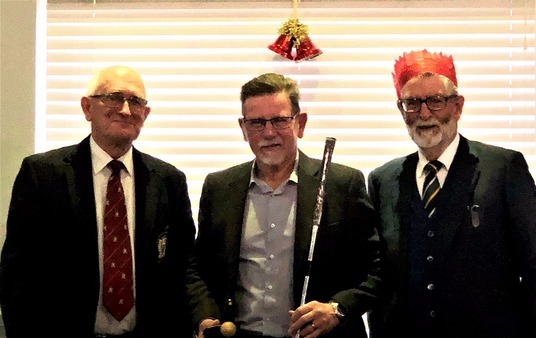 The competition was open to anyone who had represented the Club in an inter-club match during 2017. 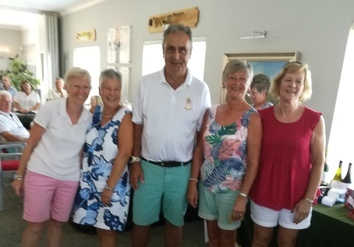 We play in an amazing number of matches through the year across a diverse range of sections including; Ladies Scratch, Ladies Shield, Ladies Seniors Seniors, Seniors Scratch, Men’s Winter Scratch, A & B Summer Scratch, Mid-handicap, Men's and Mixed. In total 80+ matches were played and approx 150 different members represented our Club, some on many, many occasions across a range of formats. 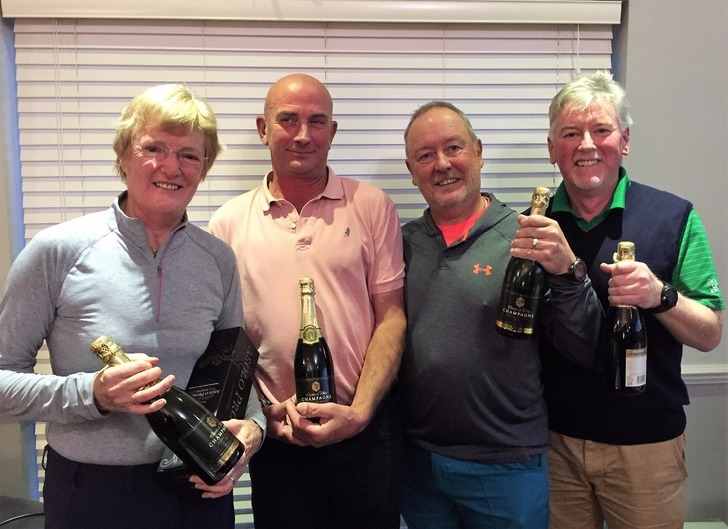 3 Teams tied 2nd place on 78 points, but on count back the prizes went to Sheila Fairey, Barry Sullivan, Roger Dilley and Mick Keens. 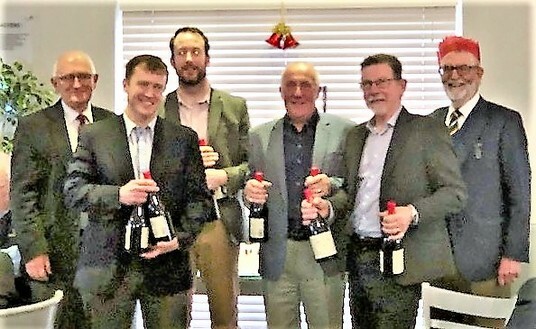 The Winning Team - with bubbly! 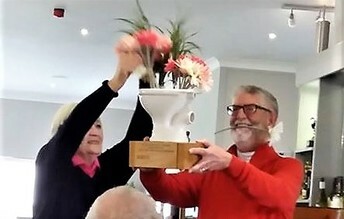 Saturday saw the annual BOGS (Captained by John Farnworth) v BLOGS (Captained by Anne Harris) 4BBB match, with all pairings fighting it out to the very end to see who would claim the honour of holding aloft the Lavatory Trophy! A chilly, windy morning greeted the assembled and some might say brave golfers, just as the dawn was breaking. Muted voices discussed team tactics for this 'serious' match and the honour of winning the 'Lavatory Trophy'. 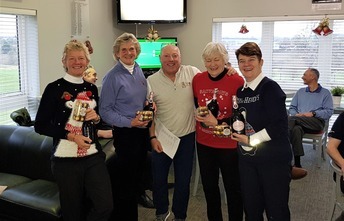 The question being pondered was, ‘Would the ladies retain the trophy and in doing so it remain resplendent with its floral decoration above the bar for another year’? The foursomes set forth with determination and resolve. 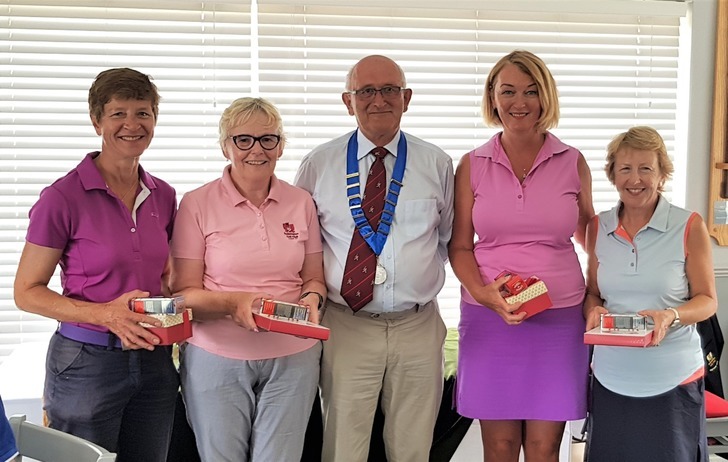 Some fantastic play from the ladies pushed the chaps to their limits and some superb scores resulted in surprise victories for many ladies pairs. The results were added up whilst the participants warmed themselves with a hearty lunch of homemade soup and with bated breath, John read the results. 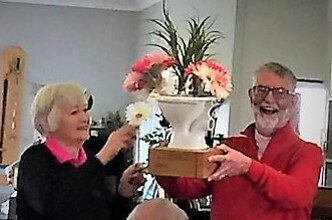 John 'bowled' over to receive the trophy from BLOGS Captain Anne! Sorting out the floral arrangement! 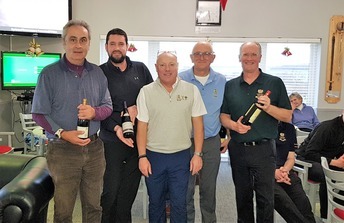 Last Wednesday saw the first Staff vs Officers match where members of staff from the Pro-Shop, the greenkeepers & clubhouse, captained by Santino took on member’s from the Committee and Board, captained by John Simpson. In the first of what will become an annual event, no fewer than 14 in each team fought for the honour of securing the initial 'winners' engraving on a brand new trophy. With strong winds and heavy showers, it was a very tough day for all the players. 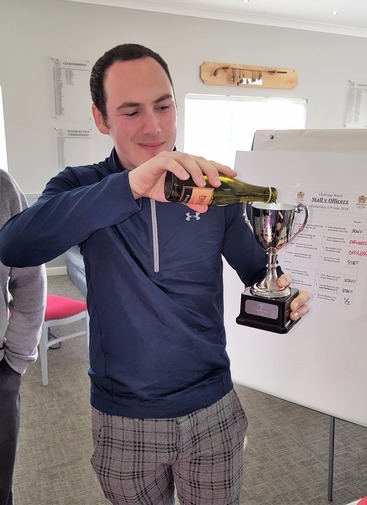 In the end though, the staff prevailed, with our very own Richard (nerves of steel) Banks, holing a 10 foot putt on their last hole to win their match and secure the trophy. Everyone agreed that it was a great event, with members from both sides who didn’t even play turning up to show their support. After the golf, the club put on a fantastic BBQ which was enjoyed by everyone. Celebrating as you might expect the winning captain to! ...better luck to The Officers in 2018!